diskAshur Pro2 (pronounced “disk assure”) is the second generation of what manufacturer iStorage calls “the most secure hard drive ever made.” This is accomplished in a few different ways, most notably with the black, epoxy-coated keypad built into the top of the enclosure that makes the drive look like high-tech gear you’d see in a James Bond movie. The keypad is used to enter a PIN code between seven and 15 digits long that enables the user to access the disk’s contents. When the hub-powered device is plugged in, three LED lights above the keypad show the current status: Red when locked, green when unlocked, and blue for admin mode. Enter the code, press the Unlock key, and the lights blink as the drive mounts. Weighing under half a pound, the hardware is handsome and ruggedly built; at only 4.88 inches long, 3.3 inches wide, and 0.79 inches thick, the extra security measures add little bulk to the enclosure. The only downside is the insanely short 3.5-inch USB cable built into the case—while handy, you’ll need an extension to plug directly into desktop computers, although MacBook users will be fine. On the plus side, the cable tucks neatly away inside the right edge when not in use. In addition to PIN authentication, diskAshur Pro2 offers a tamper-proof design. Internal components are coated in epoxy resin, and attempts to break into the enclosure trigger the built-in brute force protection. This feature also kicks in after entering an incorrect PIN more than 15 times. I’m fairly certain you’d do irreparable harm to the hard drive trying to crack this thing open. With an IP56 certification, the casing is water and dust resistant, and there’s a desk lock slot available for keeping it tied to your desk while in use. If that’s not enough, the package includes a nice zippered protective carry case. diskAshur Pro2 comes with a protective carrying case. Another benefit of diskAshur Pro2 is cross-platform compatibility—formatted for Windows NTFS, the drive can be used on anything with a USB port, including Linux, Android, and Chrome. That includes macOS, although you’re limited to read-only access without installing a utility like Paragon NTFS for Mac ($20), the excellent third-party file system driver that enables writing to Windows-formatted volumes at native speeds. Other than this Mac-specific requirement, diskAshur Pro2 requires no other software. The full-disk, military grade AES 256-bit XTS encryption is entirely hardware-based, taking place in real time with zero impact on USB speed. On my Late 2015 27-inch iMac Retina 5K, transfer rates averaged a respectable 43MBps read/write—on par with standard portable hard drives, although iStorage claims the device is capable of more than triple that speed on supported USB 3.1 hardware. Out of the box, the drive uses a default admin PIN code that you’ll want to change right away; it’s easy to do, and the hardware supports a separate user PIN for those who need it. There are a few restrictions; PIN codes can’t use sequential or repeating numbers, but the Shift key allows for plenty of potential combinations using keypad numbers and letters. diskAshur Pro2 automatically locks when ejected, but unattended auto-lock can be configured for between five and 99 minutes. You can also manually press the lock button on the keypad at any time, although this displays a “Disk Not Ejected Properly” warning on macOS. After five failed attempts to enter a correct PIN, the drive must be unplugged and reconnected before trying again; another two rounds of the same will wipe the entire drive clean, along with all associated PINs and encryption keys. Despite the higher price per megabyte, this portable hard drive delivers for those who require maximum security. I tested a 500GB version ($289 on Amazon) for this review, but iStorage also offers 1TB ($375 on Amazon) and 2TB ($450 on Amazon) capacities. 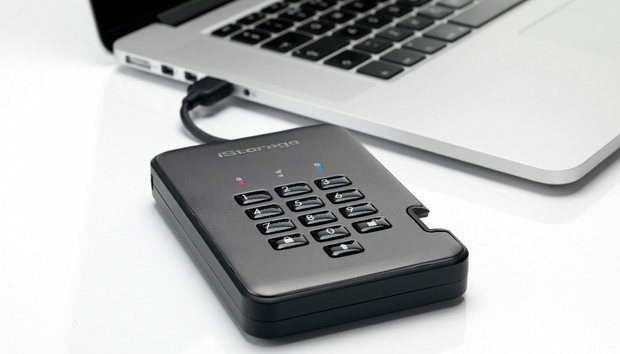 Although overkill for average users, diskAshur Pro2 offers portable storage with durability and maximum security, provided you’re willing to pay for it and have the Mac software to allow read/write access.